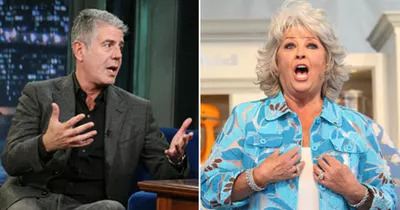 Bad boy No Reservations star Anthony Bourdain has accused celebrity chef Paula Deen of contributing to the nation's obesity epidemic. The notoriously outspoken bad boy of the food scene is at it again. Last week, No Reservations star Anthony Bourdain told TV Guide how he really feels about some of the Food Network's biggest celebrity chefs, including Rachael Ray, Guy Fieri, and most notably, Paula Deen, whom he called "the worst, most dangerous person to America." Bourdain is hardly the first person to accuse Deen of fattening up her fans. Other public figures, such as Barbara Walters, have scolded her for the nutritional content of her recipes, particularly those aimed at children. No one at the Food Network nor Deen herself is denying that her meals are buttery, fatty, artery-clogging, cream-cheesy, and just plain bad for you. But is she really captivating a nation to the point where we're getting fatter as a result? The American obesity debacle obviously can't be pinned on a single celebrity chef. The reality is more complex. It's true that many of Deen's recipes aren't good for your waistline, but you may not even need to eat her food to be influenced by it. A growing body of research suggests that our national obsession with food entertainment may be unconsciously affecting our appetites. Earlier this year, I spoke with nutritionists and experts who have studied what exactly drives us to eat things like deep-fried butter balls (yes, that's a real Deen recipe). And they told me that seeing a "desirable" food—whether in a magazine, on TV, or in person—can drive us to feel hungry even when we aren't. Research suggests that even just watching Paula Deen prepare dishes like Fried Butter Balls could send you running to the fridge. What's more, high-fat food typically has a greater impact on us in this respect than healthier options. In one study, images of pizza and burgers triggered brain activity in women in areas associated with appetite, more so than fruits and salads. That's bad news for Deen fans. Deen wasn't too pleased with Bourdain's bullying, and in true Southern fashion she fired back, defending herself and her fellow Food Network personalities. "My friends and I cook for regular families who worry about feeding their kids and paying the bills," she told the New York Post. By encouraging families to cook, Food Network stars—even Deen—may actually be helping in a way. They may not make Bourdain wish he had Smell-o-Vision, but if Rachael Ray's half-hour meals make it possible for working parents to sit down for a family dinner with the kids, that's great: Studies have linked family meals to better nutrition for the entire family. Food, nutrition, and obesity warrant serious conversations, and if it takes Bourdain's cutting tongue to spark the discussion, so be it. At the same time, Deen's impassioned response—and the copious media attention it attracted—is a reminder that Bourdain and Deen are dueling all the way to the bank. Their opinions on taste and quality couldn't be more different, but whether they'd admit it or not, they are playing for the same food-culture, food-media, food-frenzy team. And in their own way, they both continue to feed—and profit from—our country's mania for food. As bystanders, we should be aware that all this talk about food may be stimulating our appetites. Our bodies and brains will try to trick us into eating, so willpower and dietary knowledge will have to win out over raw temptation—at least most of the time.